Unless you like House Sparrows more than I do, you won’t be impressed by my best bird of the weekend. Corey, on the other hand, pulled a Philadelphia Vireo that Will Raup spotted at the Coxsackie Creek Grasslands Preserve while Corey was busy looking at a Song Sparrow. After a brief moment of Corey thinking Will had gone off the deep end Corey saw the bird too. It was a lifer for Corey’s dad, Wes, not surprisingly, but was also a lifer for Will. Was a pretty terrible weekend for birding in Austin. Cold front (relatively speaking) blew out all the migratorys from the first cold front. Saw a few warblers of various kinds, but not much else. Gues smy best bird was the first of season Gray Catbird. 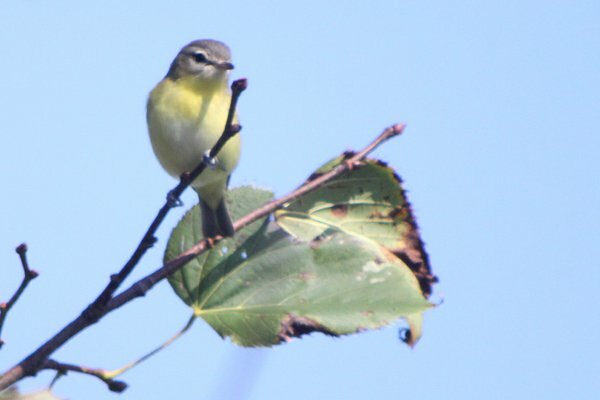 A Philadelphia Vireo would be good news around here any day, but the weekend on the north shores of the Great Lakes nevertheless gave up some worthy reports. My own “best bird” was a single Rusty Blackbird, perched low in some weedy scrub at the top of a dry hill in a populous city park. Most of my time, however, was spent at the Rosetta McClain Gardens Hawkwatch in Toronto’s east end. The Harlequin Duck is still hanging out at the Antelope Island Causeway north of Salt Lake. That was pretty cool. Seeing a Peregrine Falcon out on the causeway was really neat too as I’ve only seen them in downtown Boise and Salt Lake…so extra special seeing one out in the wild (or rather, away from human structures). My best bird(s) of the weekend were the Cape May warblers that were all over Cape May NJ. Nice to see the bird that is named for the place actually in the place! I have pretty good photos on my blog now – http://www.phillybirdnerd.net if you want to have a look. I also had the opportunity to study the difference between Cape May and Blackpoll up close as both birds were foraging in the same tree at almost eye level for a few hours on Saturday. My best bird of the weekend was seeing Merlins at the Chincoteague NWR in Va. A lifer for me. My best 2 birds of the weekend were none too exotic, but I was honestly happy to see any birds. There is an exceptionally beautiful feral pigeon living in the street my new house is on – I’m going to try to get a picture, it is a real beauty. Second, the common raven I saw in the Lake District yesterday. Seeing it circling in the mist so close by when I stopped for lunch on my way up the fell, in the amazingbeautifulrefreshing rain (I’m so out of shape, I thought I was going to explode!) was one of those moments that makes all the wet feet and sore legs worthwhile.Totally made up for the lack of any views under all the fog too! So atmoshperic. My best bird of the weekend, in most people’s books, would be the Nashville Warbler hanging out in a patch of parkland outside of the Lincoln Park Zoo. We got a decent look before it jetted. But to me, the best bird was the Ovenbird scratching around some pine trees on the Northwestern University campus. Both are lifers, but I’ve been pining (pun half-intended) for an Ovenbird for years, simply because they are so cute! Rundowns of both (and pics of a Wood Duck and other non-bird objects) at http://www.blog5b.com. I usually never have anything to post in response to this question. Today we were returning to home from Rochester, and stopped by Montezuma NWR. Hadn’t done my research on what was here – we just stopped by. As we paused at the side of the road, a fellow birder asked if we had any new info on the red phalarope. Huh? We got to the spot where he told us it was supposed to be, and voila! there was the bird – and a crowd watching it. One of the easiest rare birds I’ve chased. And, it was a lifer!